In the September of 2014, when BlogAdda decided to #CelebrateBlogging, the office went into a frenzy to come up with the one activity that would capture the imagination of the blogging community. After several brainstorming sessions, an idea was born- Game of Blogs! For the first time in the history of Indian blogging, bloggers would collaborate and work single-mindedly towards one goal- write a story based on the characters given by BlogAdda. In another first, the best story would be published in the form of a book- the first collaborative blogging novel! We invited bloggers, extended personal invitations to them and finally had 30 teams of ten members each! Let the games begin! The rules were simple- each team would have to write 1 blog post a day, weaving an absorbing story as they went along. This entailed a huge collaborative effort from the teams as they had to coordinate the order and content of the story which had to be written. The jury for Game of Blogs consisted of the top names from the author community, including Ashwin Sanghi, Natasha Badhwar, Ravi Subramanian, Meghna Pant, Raksha Bharadia and Kiran Manral. The teams employed every means of communication available- calls, messages and social media to come together to write amazing blog posts each week, breathing life into all the characters and adding some of their own. So much so that at the end of Week 1, the impressed judges decided not to eliminate any team! Round Two saw the introduction of a twist in the tale, with BlogAdda throwing a curveball at the teams. The teams responded and how by hitting a home run on the twist, making the stories more interesting! Sadly, 20 teams were eliminated after Round Two as 10 teams carried on with the Game of Blogs challenge. BlogAdda felt that none of the stories should remain incomplete, so we introduced a Wild Card round where the eliminated teams could continue with their stories and get a chance to still be in the reckoning. The Game of Blogs teams had the time of their lives (their words, not ours) putting their heads together and writing some great quality fiction content which though written by different people, had to look seamless. At the end of the challenge, we announced the Top 5 teams which had bowled over the jury with their stories. You must be wondering why we are telling you this, because you have lived the excitement of Game of Blogs and #CelebrateBlogging with us. 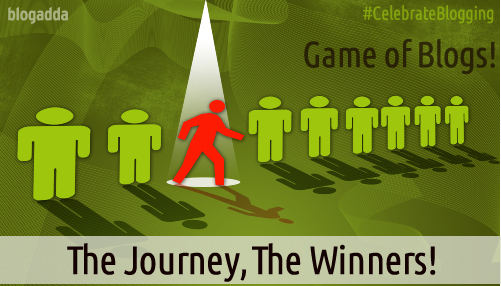 Well, we just wanted to relive those moments with you before we announced the winners of Game Of Blogs! A huge round of applause to all the winning teams! Thank you to all of you who participated in Game of Blogs and gave us unforgettable stories. It is because of you that #CelebrateBlogging became a huge celebration in the truest sense. A big thank you to the judges who pored over hundreds of pages of stories and selected the best stories from Game of Blogs. Thank you so much for adjudging my team (Tete-a-ten) as one of the winners! 🙂 The experience of writing with other bloggers was honestly very exciting.